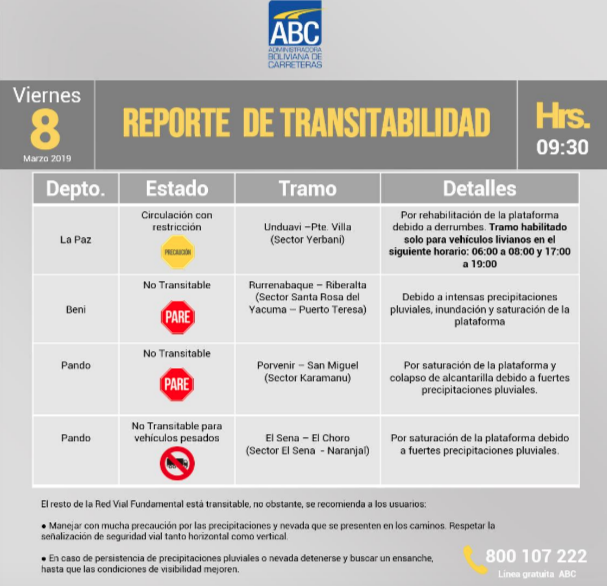 The Bolivian Highway Administration (ABC) reported today [03/08/2019] that two sections were closed and vehicular traffic was restricted in two others, from the roads of the departments of La Paz, Beni and Pando due to the heavy rains. “In the department of Beni, it is not passable the section Rurrenabaque-Riberalta, sector Santa Rosa of the Yacuma-Port Teresa, due to intense precipitations, flood and saturation of the platform”, indicates the report of passability. 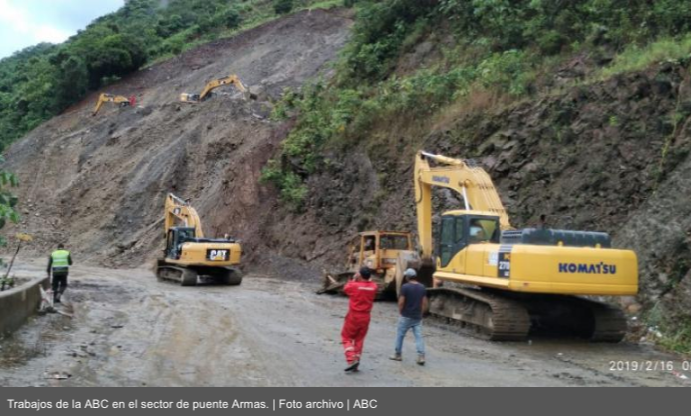 According to that document, ABC also closed the Porvenir-San Miguel section, Karamanu sector, of the department of Pando, due to the saturation of the platform and the collapse of the culvert due to heavy rains. On the other hand, in Pando, vehicular traffic for heavy motor vehicles was restricted in the section El Sena-El Choro, Naranjal sector, due to saturation of the platform due to heavy rainfall. In La Paz, the Unduavi-Puente Villa section, Yerbani sector, was restricted for hours due to the rehabilitation of the platform that was affected by landslides and that road was enabled for vehicular traffic from 6:00 a.m. to 8:00 a.m. and a 5:00 p.m. at 7:00 p.m. The ABC reported that the rest of the country’s Basic Road Network is passable and recommended driving with caution due to heavy rains and respecting the safety signals to avoid traffic accidents.